Pastor Rey continues the "Can You Hear Me Now?" 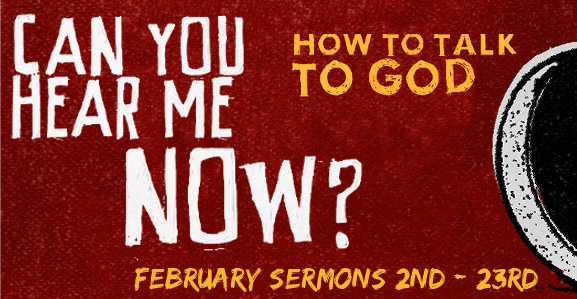 series, diving into prayer life and growing closer to God. This week he addresses the difference between praying for things as if God is our magical genie verses fully submitting to God's will. To prayerfully surrender to God. It’s not what you think. It’s not a prayer that will make God do your bidding. Most of my efforts in prayer have been trying to figure out how to pray in such a way so that God would always answer my prayer. I would never have said it, but basically I wanted an all-powerful genie I could summon for my request. I have a sneaking suspicion that it’s not just me looking for a magical panacea to my problems in prayer. Maybe that’s why most of the best selling books on prayer promise us a method or strategy on how to pray in such a way so that we can ‘move’ God. Maybe there is something in all of us that likes the idea of having God on a leash. At our command. At our control. It’s the prayer of surrender. It’s getting to the place where you put God’s will above your own. It’s moving in God’s direction and not trying to move God in your direction. It’s not trying to bend God in your direction, but allowing God to bend you in His direction. It was hard to even type those words because it’s so scary. But that is why Jesus told us to pause. So that during the pause we could see God as our heavenly Father and King, who we can trust. The prayer of surrender requires trust. And when I trust God, I can say, with my whole heart “Your will be done.” Because I know His will is best for my life. You see, this prayer works every time, not because it moves God, but because it moves you. It moves you in God’s direction. And that is the purpose of prayer. To recalibrate our hearts. To realign our hearts. To sync our hearts with the heart of the Father. - Do you trust God? - What areas of your life do you struggle to surrender to God? - Why do you think that is? - What would your life look like if you truly surrendered to God? Even you want to hear the whole message, please visit us by checking out our website, or you can email us if you have more questions.